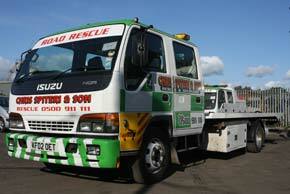 Our modern fleet of recovery vehicle are able to recover cars, vans and motorbikes across South Wales. We operate 24 hours-a-day and aim to respond within 1 hour. All 'off-road' incidents will be supported by photographic evidence. We provide a 24 hour freephone multi-line link to our control centre, thus ensuring that there are no delays in accessing our services. Attendance times are prioritised to be within thirty minutes of receiving the call, with a maximum permitted allowance of 1 hour. 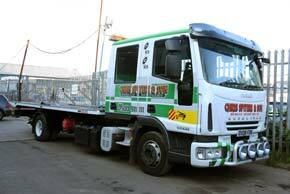 We are able to transport casualty vehicles to any destination within the UK. Wherever possible we offer motorists the option of repairing the vehicle and providing a courtesy car to minimise disruption to journeys.